Windows Azure features are occasionally rolled out as a Preview feature that requires opt-in signup. 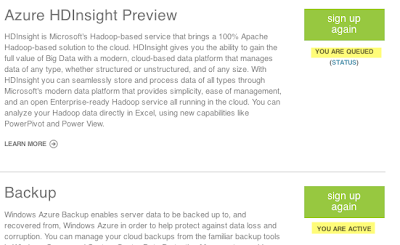 Such is the case with the new HDInsight Hadoop-based Big Data service, as well as the Windows Azure Backup service and Hyper-V Recovery Manager service. So... where are these features hiding, and how can you sign up??? One last thing: You may have noticed, in the signup box, the message that charges may be included. Simply put: Preview does not necessarily equate to free. You'll be consuming real cloud resources, so there's sometimes a charge for this (just look at Windows Azure Web Sites, which has a charge for shared and reserved instances, or Virtual Machines, which had discounted VM pricing when they were still in Preview, with discounted rates in effect through May 31, 2013). 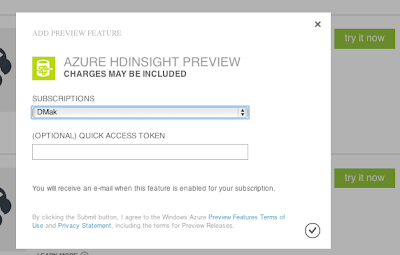 Preview services that do have charges are discounted due to their non-production status. 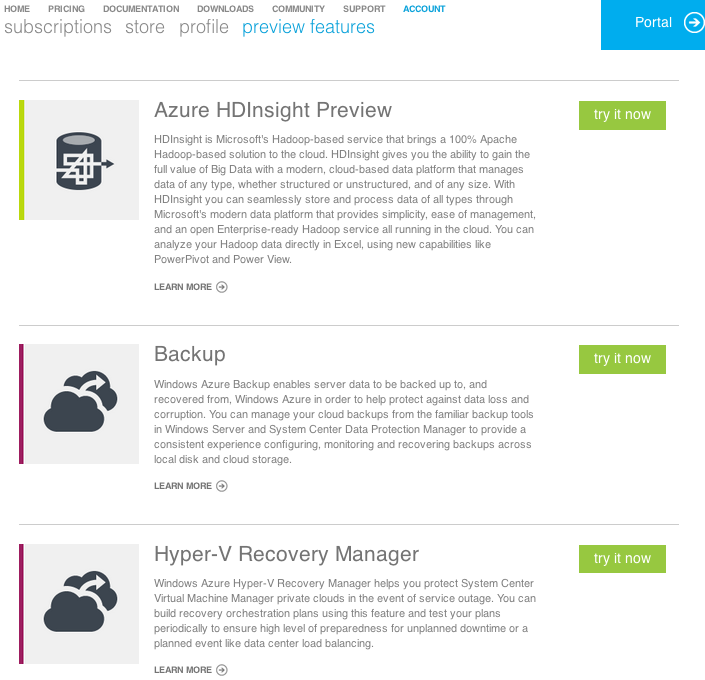 Backup service is free for first 5GB, $0.50 / GB / month over 5GB, and discounted 50% during preview. More details here. 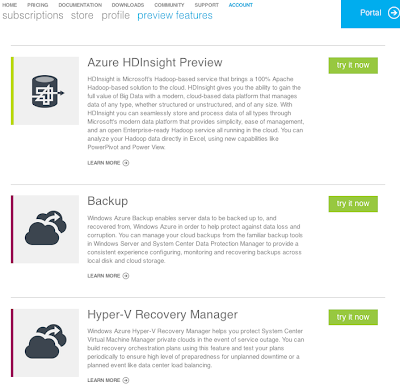 Hyper-V Recovery Manager is currently free during preview, with pricing to be announced later. More details here. 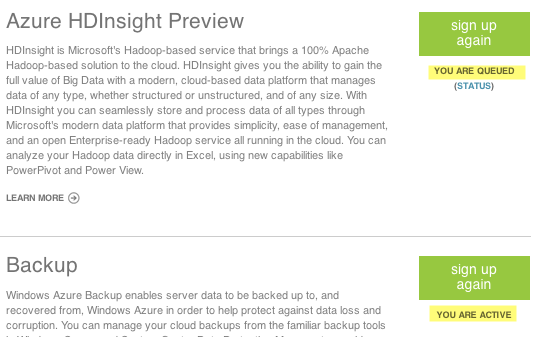 HDInsight is discounted 50% during preview, with Head Node at $0.32 / hour and Compute Nodes at $0.16 / hour. More details here. Were you able to preview Hyper-V Recovery Manager? It requires a Quick Access code and is not optional. Philip - that's interesting - I hadn't noticed that before, but you're right: it's not an optional token field. I need to ask about that internally. I'll update the post when I find out more. Thanks for pointing that out! Hi, I'm in the same boat. Would really appreciate an update on this to start evaluating the Hyper-V Recovery Manager. Ok just heard back: Currently the Hyper-V Recovery Manager is in limited preview, which does require a token. I don't have any information on when this would become a broader preview when anyone could sign up. As soon as something's announced, I'll be sure to blog about it.